Old Elthamians and Darlington Mowden Park go head to head at the summit of National One while second placed Chinnor look to continue their wonderful start in Round Three. Mowden Park are the only side in the division to have secured maximum points and they travel to a confident Old Elthamians outfit who sit just a point behind the early league leaders after victories over Rotherham Titans and Blackheath in their opening two matches. Both clubs have begun the campaign impressively, but newly promoted Chinnor are arguably the standout team so far. Back to back wins over Plymouth Albion and Ampthill & District has given Matt Williams’ side the perfect start to life in National One and they will be hoping that continues when they visit Cambridge this weekend. Elsewhere in National One, Rosslyn Park and new boys Sale FC will be keen to maintain their unbeaten starts to the term when they travel to Rotherham and Cinderford respectively, while Ampthill host Esher and Blackheath go to Plymouth. Also, Bishop’s Stortford entertain Birmingham Moseley with Loughborough Students taking the trip to Caldy on Sunday. Two of the early pace setters in National One meet in Round Three as league leaders Darlington Mowden Park visit an unbeaten Old Elthamians side. The visitors travel south on the back of a stunning bonus-point win over recently relegated Rotherham Titans, which leaves DMP one point clear at the summit heading into this weekend. It is still very early days, but Danny Brown’s men are showing all of the qualities which saw them finish second last term and it looks as though Old Elthamians are also picking up from where they left off in 2017/18. Gavin Lach’s side finished sixth last season and they have been mightily impressive in the opening two rounds. A derby day triumph over Blackheath last Saturday was another statement of intent from OEs after an opening day win against Rotherham and now they will be aiming to pick up another significant victory this weekend. To get a new season underway with back to back victories is always a nice feeling, but for newly promoted Chinnor, they must be on cloud nine heading into this weekend. The Oxfordshire side have defeated two possible title challengers – Plymouth Albion and Ampthill & District – to begin their first ever campaign in National One and currently, Matt Williams’ men sit second in the table. A dream start may well be an understatement for Chinnor, but after two superb victories, they will be keen to back it up when they visit Cambridge in Round Three. The Blood and Sand remain unbeaten after the opening two rounds and Richie Williams clinched his first win as Director of Rugby last Saturday as Cambridge edged past Loughborough Students. Their first game of the term was an enthralling 36-36 home draw with Sale FC so Cambridge will be hoping for a much quieter afternoon at Volac Park as they go in search of successive victories. Rosslyn Park will be very satisfied by the way they have begun this season. After a really tough campaign last year – which saw Kieran Power’s men fend off relegation – Park have started on the front foot with consecutive wins against Cinderford and Bishop’s Stortford. The men from the Rock now travel to South Yorkshire this weekend to take on a Rotherham Titans outfit which is still adapting to life in National One after relegation from the Championship in April. Joe Barker’s side have lost both of their opening two games against Old Elthamians and Darlington Mowden Park, but they are a team which is certainly in transition. There were signs last Saturday that the new look Titans are beginning to gel and a victory at Clifton Lane in Round Three would be a much-needed morale booster. ‘An abject first 40.’ That was how Ampthill and District Director of Rugby Mark Lavery described his side’s first half display against Chinnor last Saturday. In the end, their performance in the opening period cost the A’s who suffered a narrow defeat at Kingsey Road after beginning the campaign with a victory over Loughborough Students. The Bedfordshire outfit are back at Dillingham Park this Saturday and they will be itching for a reaction when they welcome Esher. As for the visitors, they may have lost both of their opening fixtures at home against Blackheath and Plymouth Albion, but Ricky Nebbett’s side were unfortunate to pick up just one point against the latter in Round Two. Esher were narrowly beaten by Albion, but they will take positives from that defeat and carry them into this fixture with Ampthill as they aim for their first triumph of the new season. Two of the newly promoted sides clash in Gloucestershire this weekend as Sale FC face Cinderford. Sale travel to the West Country in high spirits after securing their first ever victory in National One following their win over Caldy last Saturday to continue their remarkable record at Heywood Road. After sealing their 16th consecutive home win, Jonathan Keep’s side will be aiming to reach the next milestone which is a maiden away triumph in National One, but Cinderford won’t be a straightforward task. Like Sale, Paul Morris’ men also picked up their first victory of the new season in Round Two as they defeated Birmingham Moseley in the Midlands and the Foresters will be keen to build on that win this Saturday. Last season, both of these sides scored well over 1000 points so we could be in for an exciting contest at Dockham Road. Plymouth Albion and Blackheath finished in the top five last season in National One, but they have both had mixed fortunes at the beginning of this campaign. Blackheath make the trip to Brickfields this Saturday having lost their derby clash with Old Elthamians at Well Hall. 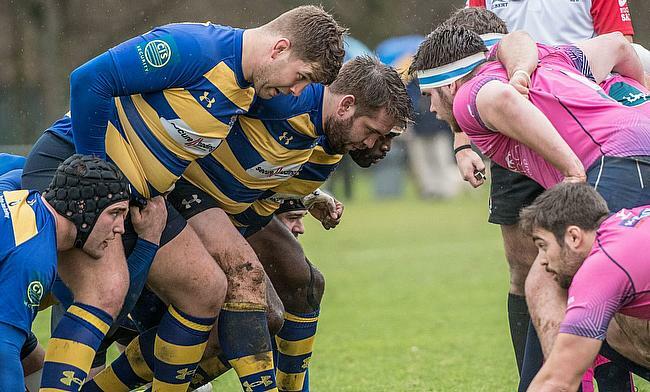 James Shanahan’s side couldn’t click into gear in the second period and after a solid opening day win over Esher, ‘Club’ will now be aiming to bounce back on their travels. It is a similar story for Plymouth. Kieran Hallett’s men suffered a surprise defeat to Chinnor in Round One and were pushed all the way by Esher last weekend, but they were able to secure an important victory to get their season up and running. Albion may well harbour promotion hopes this term and a first home win of the new campaign would put them back on the right path towards a possible title challenge. For the second week in a row, Birmingham Moseley saw a lead slip away from them. Richard Protherough’s side were ahead at half-time against Cinderford, but once again, they ended up on the wrong end of the result as they suffered back to back defeats. Moseley are missing a few key players, but the Midlands side will be itching to gain their first win of the campaign when they visit Silver Leys this weekend. Bishop’s Stortford would have been frustrated after their defeat against Rosslyn Park last Saturday. Too many mistakes in the first period were punished by Park as Stortford fell to their second consecutive loss of the campaign. After a very pleasing season last year following promotion from National Two South, Andy Long’s side will be hoping they can spark this term into life in Round Three. Caldy meet Loughborough Students this Sunday aiming to respond after their narrow defeat away at Sale FC in Round Two. Simon Verbickas’ side could easily of snatched the victory in the dying minutes at Heywood Road, but in the end, they had to settle for a losing bonus point. The Wirral outfit are back at Paton Field in Round Three and Caldy have lost just two of their last eight games at home so Loughborough Students will know they will be in for a tricky test this weekend. After losing by nine points on the opening day against Ampthill and District, the Students also suffered a narrow loss to Cambridge last Saturday so they will be eager to turn their near misses into a success this Sunday. The Midlands club are without a win in their last four competitive games so Alan Buzza’s men will be keen to put a stop to that unwanted record as soon as possible.